Golden Moka captured the Prince of Wales stakes and a $300,000 prize in the second jewel of Canada's Triple Crown of horse racing Sunday at the Fort Erie Race Track. Photo by Laurie Langley. Golden Moka, a 10-1 longshot, won the $500,000 Prince of Wales Stakes at Fort Erie Race Track Sunday. Big Red Mike, trained by local horsemen Nick Gonzalez, was favoured to win 4/5 after taking the Queen’s Plate last month in a wire-to-wire romp but placed third behind Mobil Unit. Jockey Anthony Stephen took Golden Moka to the lead early in the 1 3-16th-mile event. 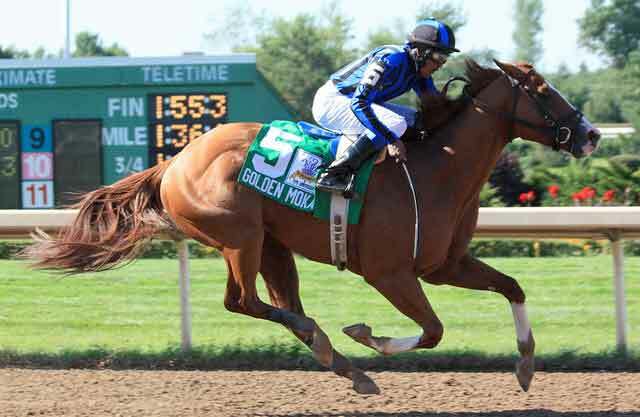 With the victory, Golden Moka earned the $300,000 winner’s share. Golden Moka topped the six-horse field in 1:56.45 on a fast track. The field was reduced to six with the late scratch of Dark Cloud Dancer.